We’ve been slacking on our company-wide workshops this month, as our noses went to the grindstone for “He’s Barack Obama”, but today the workshops have returned! For the uninitiated, we have so many talented people here with so many different , every once in a while we all sit down and try to pass along our unique abilities. Trish took the time out of her day to share her plushie making powers with the team, teaching techniques on cutting felt patterns, double threading and general tips to make cool cushy critters. 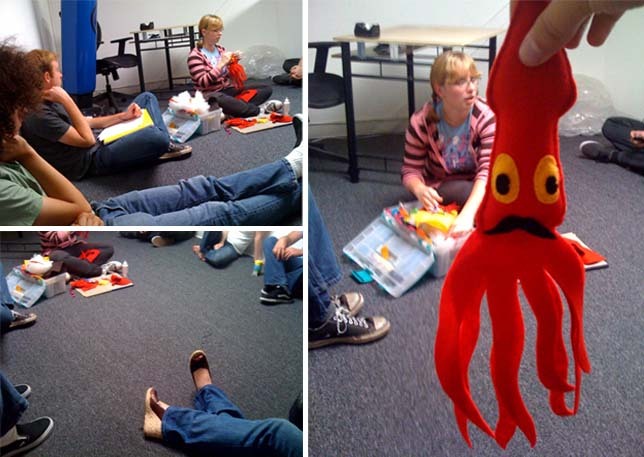 As you can see, we created a JibJab squid in the process! What shall we name it? This entry was written by paulhanges and posted on June 29, 2009 at 7:14 am and filed under Uncategorized. Bookmark the permalink. Follow any comments here with the RSS feed for this post. Trackbacks are closed, but you can post a comment. We shall name it squishy and it shall be our squishy.